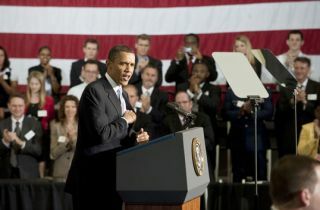 U.S. President Barack Obama speaking at NASA Kennedy Space Center. The White House is expected to unveil a newU.S. space policy June 28 that emphasizes international cooperation andcommercial space. ?This policy seeks to strengthen our domesticcommercial space industry and reestablish U.S. leadership in the internationalcommunity,? states a one-page summaryof the policy obtained by Space News. The June 25 document ? ?NationalSpace Policy Top-Level Messages? ? was created by Peter Marquez, directorof space policy for the White House National Security Council. ?It is the shared interest of all nations toact responsibly in ways that emphasize openness and transparency, and helpprevent mishaps, misperceptions, and mistrust.? The document also says, ?A robust andcompetitive commercialspace sector is vital to continued progress in space. ?The United States is committed toencouraging and facilitating the growth of a U.S. commercial space sector thatsupports U.S. needs, is globally competitive, and advances U.S. leadership inthe generation of new markets and innovative entrepreneurship.? One of the specific goals of the new policy,according to the summary document, is making the U.S. space industry morecompetitive in global aerospace and technology markets, including ?satellitemanufacturing, satellite-based services, space-launch terrestrial applicationsand increased entrepreneurship.? The new policy also calls for expanded internationalcooperation in the peaceful use of space and the promotion of safe andresponsible operations through improved data collection and sharing aimed atavoiding in-space collisions, protecting critical space and ground systems andmitigating orbital debris. ?Increase assurance and resilience of mission-essential functions enabled by commercial, civil, scientific, and national security spacecraft and supporting infrastructure. ?Pursue human and robotic initiatives to develop innovative technologies, strengthen international partnerships, inspire our Nation and the world, increase humanity?s understanding of the Earth, enhance scientific discovery, and explore the solar system and the universe beyond. ?Improve space-based Earth and solar observation capabilities needed to conduct science, forecast terrestrial and near-Earth space weather, monitor climate and global change, manage natural resources, and support disaster response and recovery.? The White House is expected to formallyunveil the policy June 28, according to government sources. SpaceNews, dedicated to covering all aspects of the space industry.